← Arsenal ditched Arsène Wenger, and got a new manager – anywhere near ‘winning the Premier League’ now? Many of us will know that next Tuesday, 5th February is the start of Chinese New Year [the year of the Brown Pig indeed]. Now while we in the West have our New Year on a specific (Gregorian) calendar date of 1st January, the date of the Chinese one varies as it begins on the new moon that appears between 21 January and 20 February. The other thing of course is that although it is called “Chinese New Year” it is not just the country of China that is involved here but it is a festival that applies to China’s neighbours and those of the Chinese culture worldwide – so major festivities in Korean, Vietnam, Tibet, Singapore, Indonesia, Malaysia, Thailand, Cambodia, and the Philippines. Of course, many of us in UK, the rest of Europe, and America also take the opportunity to join in the fun and partying (and not only in major cities, it has to be said) with colourful Chinese New Year parades passing through the streets, Dragon dancers with drummers performing to scare away evil spirits, stilt walkers in traditional garb, energetic Giant Doll heads performing captivating ribbon dances, while others are grabbing the occasion to enjoy Chinese cuisine. That all said, what can we in the West learn from the Chinese civilisation of old, then? Chinese culture with its customs and traditions, is the dominant culture in East Asia and is one of the world’s oldest, going back many thousands of years. Well, for a start their New Year holiday (now known as the Spring Festival in China) is the cause of the largest annual mass human migration in the world – because [unlike the Islamic Hajj religious annual pilgrimage to Saudi Arabia’s Mecca], it is a traditional occasion for Chinese families to return and gather for an annual reunion – that has survived even after Communism and Mao’s cultural revolution’s failed attempts to remove the family from the centre of Chinese life. There is a big lesson to be learnt there as that level of commitment to family is badly missing in our society and certainly in the UK – it has rapidly evaporated in the last century, together with our love and respect for the elderly, eh? Conversely, in China showing dignity to and respecting of the elderly is part of the actual law, and companies are even required to give workers time off to see their parents – so honour and kindness toward seniors is part of normal life in China. Fat chance of any of that happening in Britain, don’t you think? You see, in Britain our intrinsic culture has been taken-over (from the aristocracy of course) by BIG business – that is why we seemingly can’t break-away from the deadly embrace of the EU, as its duplicitous fellow-travellers here try to thwart the peoples’ vote for BREXIT. In this Country the one aspect of true family life that we had managed to retain for centuries was the day of Sunday, which though supposedly a Christian ‘day of rest’, it indeed was for all, also a time for family. That was however then wiped-out forever by BIG business, aided and abetted it has to be said, by our scurrilous politicians and self-serving, expenses scandalous, MPs back some 25 years ago, when major retail shops were suddenly allowed to open and to trade on a Sunday – previously that had been illegal. Oh yes, workers rights were to be protected and they would earn loads of dosh if they volunteered to work, eh? Ah, that didn’t last long though, did it? No, the workers (even the existing ones) were forced into contracts of employment that ‘required’ them to work on a Sunday and do so for normal pay or very little more – consequently our previously fundamental family life has since been destroyed, just so that bloody shops can extend their control over our population’s lives. If you want to see what life here in the UK ‘should’ be like, just pop over on Eurostar for a weekend in Brussels Belgium, You will see there, the streets full of families or people out and about visiting, and certainly not heading for the major chain store retail outlets in the city centre – you see, there are restrictions in Belgium on employment of personnel on a Sunday, as well as a requirement for a complete ‘day of rest’. Oh, what a total repeal of the UK’s Sunday Trading Act would do to help repair our community’s broken family system, eh? Perhaps there are many useful lessons to be learnt by us modern well-educated Westerners from far off lands and ancient cultures, but surely one of them would have to be the one of ‘Yin Yang’ from a Chinese philosophy that it is believed to go back even centuries before the Roman empire or Christianity for that matter. It is so easy for us to disparage the efforts of those of those times who tried to make some sense of life on Earth when in those days so little was known about the Universe or science and much more. However, the truth is that they had more time and incentive for clear thinking than we have in our day and age when we are bamboozled with too many facts and constrained by political dogma and society norms on original thought. 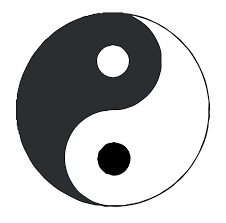 An interconnected dark and light swirl symbol, often of equal black and white halves, in full contrast with each other, is used to depict the concept of yin yang, as it is a representation of the dual nature of all things, including life on this Earth. Importantly, the symbol balances between the two opposites of dark and light, but that also includes a little of each being present in the other. 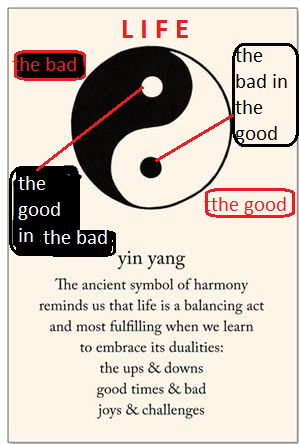 This symbolic representation of yin yang is often interpreted solely as being ‘good and bad’, or ‘good and evil’, but this can be too simplistic as yin yang is more than that, because it encompasses all things that are different but are needed to make-up the whole – like say ‘man and woman’ or ‘male and female’ which together as a whole are essential independent elements of the natural world, aren’t they? You could consider as well, say ‘positive and negative’ which sometimes ‘could’ fit into a good and bad interpretation, but if we take account of electricity, these are the two essential parts that make-up the whole and neither is individually bad (but can be). Or ‘bright and dark’ which the World gives most of us every single day, where first one is dominant and then the other, and neither can be classified as solely good and bad, can it? Oh yes, there are many different pairings that come to mind that demonstrate the duality of Yin Yang, such as fire and water, expansion and contraction, illness and health, life and death, up and down, hot and cold, front and back, awake and asleep, etc. 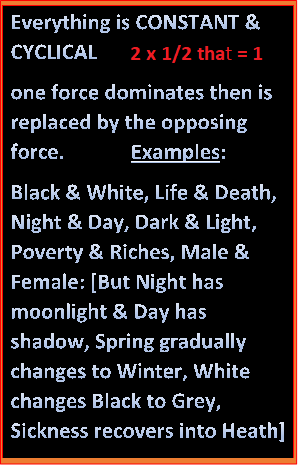 So, it is postulated that neither Yin nor Yang is static, as they change over time, and are in constant flux. Although Yin Yang humans can only fulfil their destiny by achieving successful integration with nature, do we actually do that, eh? Or instead, do we for our own solely selfish human reasons, disgracefully abuse our beautiful planet, destroy the ozone layer to allow in harmful radiation from the Sun, create climate change that melts the ice caps which will flood our coastal land, pollute the oceans with indestructible plastic that decimates marine life, destroy the habitats of wildlife and kill-off numerous species or hunt them to extinction, fill the land with toxic or non-biodegradable waste that poisons the soil, rampantly overfish the sea to the point that important stocks are on the verge of collapse, overpopulate the earth to the extent that resources and the capacity of the land is exceeded, resulting in abject poverty and dire shortages of water and food, whence the number of chronically undernourished people has increased steadily for the last thirty bloody years, together with our excessive settlements and over-cultivation to the degree of soil exhaustion or land degradation that leaves large chunks of it simply unusable which now amounts to a THIRD of the total global land area. Moreover, those of us in the developed countries take a disgracefully unfair share of natural resources, together with a fifth consuming four-fifths of the world’s goods and twelve percent of the world’s population using EIGHTY-FIVE PERCENT of its water – is that really what we in mankind should be all about, eh? 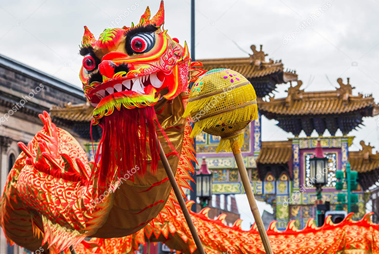 This entry was posted in BREXIT, china, community, Other Countries, planet and tagged black and white, BREXIT, chinese, Chinese culture, Chinese New Year, eu, good and bad, Spring Festival, Sunday Opening, year of the Brown Pig, Ying Yang’. Bookmark the permalink.